Pre-order version of this 10 inch, comes with special screenprinted sleeve (not 100% sure about the number of these, 25-30 only). Long in the making, but worth the wait! On April 12th Shield Recordings will release This Routine is Hell’s Repent. Repeat. 6 brand new awesome This Routine is Hell songs pressed on a 10 inch vinyl. Hailing from different parts of the Netherlands, This Routine is Hell have toured around Europe multiple times, resulting in them playing a huge amount of shows. This excessive touring is manifested in 'Repent. Repeat. ', a record that shows a band that's grown in multiple dimensions. The title expresses the tragedy of having to repent not only man's history, but also the perspective of it's repetition. Musically the band has found their own balance between using battering rhythms and creating a fitting atmosphere. Culminating in their newest release 'Repent. Repeat. ', this is their vision on dealing with a complex and diverging world. 100 x white with black splatter vinyl. 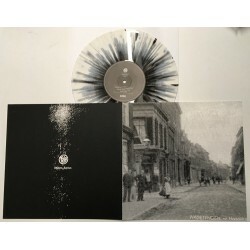 Since shipping is expensive you can also add This Routine is Hell's debute LP(or CD)for only € 5,-.